I’ve been positively itching to show you our Walls.io API in action ever since we announced the API, and now we finally have the perfect project to use as a showcase. 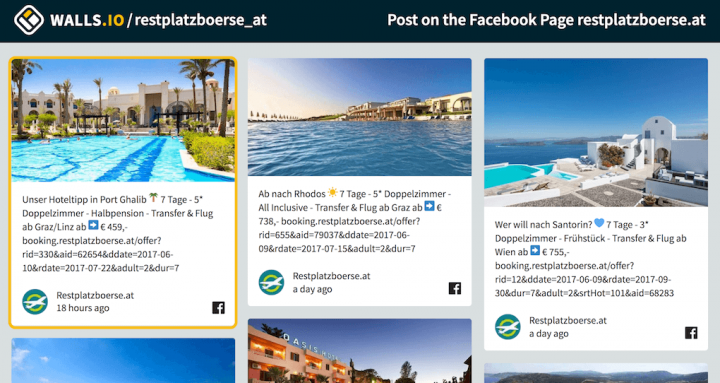 I’m excited to introduce you to this creative and innovative use of our social media wall API by Restplatzbörse, an Austrian travel booking portal. 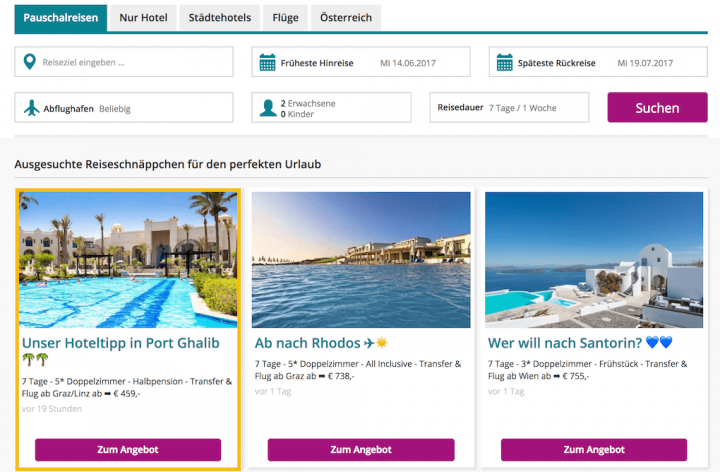 Restplatzbörse uses a Walls.io social wall and our API to transform specific posts on Facebook into bookable travel deals on the website. A huge thank you to Restplatzbörse for taking the time to tell us more about this project and giving us some insight into the technical process behind their API integration. Restplatzbörse is an Austrian travel agency and last minute booking portal for travel deals. The focus is on last minute travel, but Restplatzbörse also offers hotel bookings, package holidays and even flight search. The company is active in Austria, Germany and Switzerland. 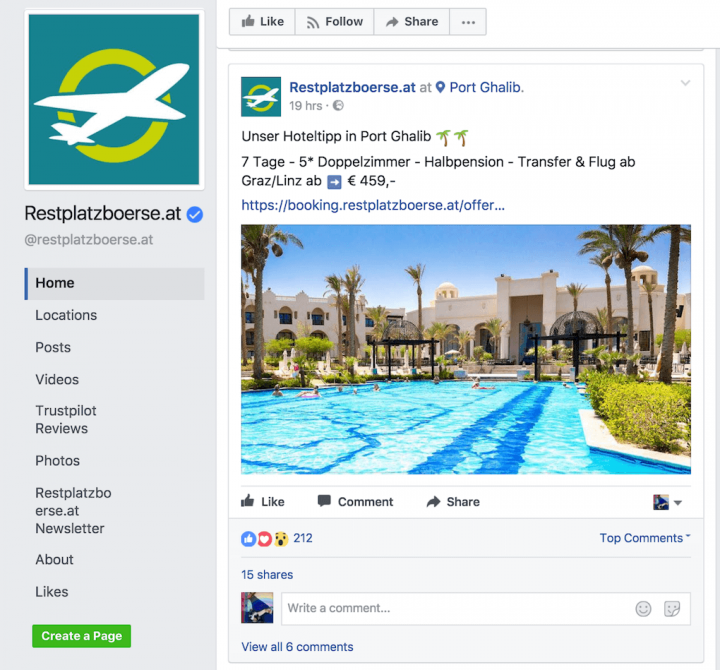 In summer 2017, Restplatzbörse put the Walls.io API to good use to automatically transform last minute offers posted to the Restplatzbörse Facebook page into bookable deals on Restplatzbörse.at. Access to the social media wall API is available with all Walls.io premium accounts. Here’s how the process works. First, new offers are added to the Restplatzbörse Facebook page just like any other Facebook post. This is possible because Restplatzbörse didn’t use our usual code snippet to embed the wall but created its very own integration using our API. We’ve talked to Alexander Hohenthaner, the lead marketer at Restplatzbörse, to see how the team has made this integration happen. What prompted you to figure out a way to feed offers into your website booking tool from Facebook instead of your regular CMS? With over 70,000 hotels and more than 70 operators on offer on our platform, there is a sheer endless amount of deals available. So we have a dedicated team, which spends every day searching for and picking offers based on various factors such as customer reviews, price, quality of pictures etc. These offers are then posted on Facebook with a direct link to the deal on our website. We had the feeling that it was a shame to just use these offers on Facebook, so we started looking for ways to implement them on our website. We now use the Walls.io feed to integrate these hand-picked offers from Facebook directly on our homepage. How are you turning social media posts from Facebook into bookable last minute offers? The Facebook posts already include the links to the offers at the end of each post. So for our website integration, we cut off everything after “http://” and then link each post to that URL instead of the standard link to the Facebook post. This way, each post on the integrated social wall on our website links directly to the corresponding deal and people can immediately book the holiday they’re interested in. Let’s get a bit technical. How was it to work with the Walls.io API? Our programmers enjoyed working with the Walls.io API because the API has a clean and easy-to-understand design and good documentation. In the beginning, we had some problems saving the emojis of the Facebook posts to the database, but we fixed that by making sure that really everything is set to utf8mb4 encoding, not just the table and the fields. In the end, it took us less than a week to develop and test our solution. Was the API use the main reason for you to choose the Walls.io premium plan? What other premium features are you enjoying? Yes, the API was the main reason. 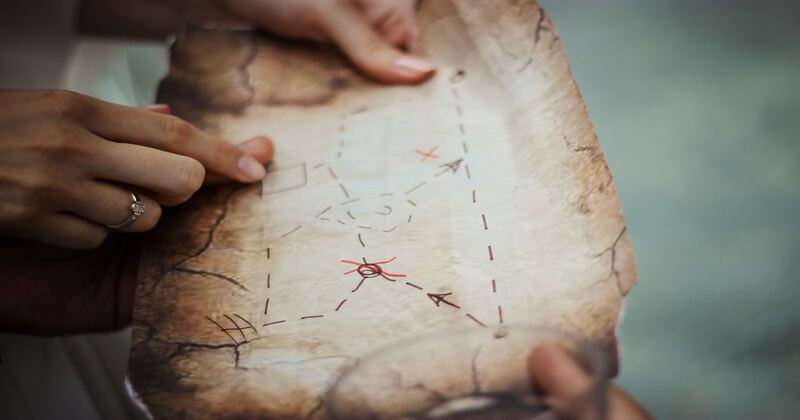 Another factor was the social map, which we want to use at a later point so our offers will pop up on a world map for people to see where they can spend their holiday. We have some other tentative plans for our social wall as well but for now, those will have to remain a secret. ? While API access is for premium accounts only, filtering is something you always have available for your Walls.io sources no matter which account tier you’re in. Filters help you tweak precisely which content you want to display on your social wall. You can filter for specific keywords, hashtags and as this project shows, also for URLs. Let’s have a look at how it’s done. Restplatzbörse fetches only bookable offers from the Facebook page and has done this using a filter. I’ve gotten their go-ahead to show you how in detail it’s done using a screenshot from their own Walls.io dashboard. 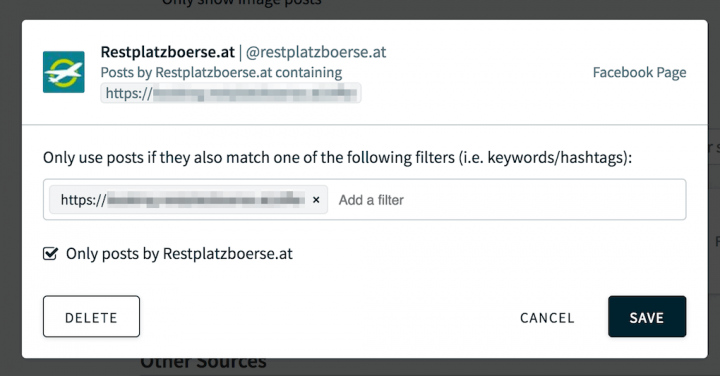 Alexander and his team set up the Restplatzbörse Facebook page as a source and added a filter for all URLs that start with a specific string. The string could be anything, but in this use case it’s part of a URL which is included in each last-minute deal posted to the Facebook page. also include a URL that matches a specific string. All other posts or comments on the Facebook page will not be displayed on the social wall. Filtering your sources gives you a lot of control and allows you to be very specific about which content to show on a social media wall. This is especially practical if you’re using a Facebook page as a source because they tend to aggregate a lot of different types of content. For example, you could include only posts using a specific hashtag for a marketing campaign or even exclude posts left by others on your page to avoid showing complaints on your brand wall. If you want to know more and create your own social media wall integration using our API, read about what you can do with the Walls.io API and check out our API documentation. And of course, you can always keep using our standard embedding feature to embed your social wall on your website in a totally n00b-friendly way.